The Anhänger (1 achs.) für Maschinensatz F (Sd. Ah. 25/1) - one-axled trailer for machine set F - was mainly used by signals units. For example, it was carried along with Fernschreibkraftwagen - teleprinter motor vehicles. Te superstructure of the Sd. Ah. 25/1 was a bit lower than that of the similar Sd. Ah. 25/2. The Sd. Ah. 25/2 was based on the Anhängerfahrgestell A 1 of the Luftwaffet. Outwardly, the Beleuchtungsanhänger N (1 achs.) (Sd. Ah. 25/3) - one axled illumination trailer - was identical constructed. 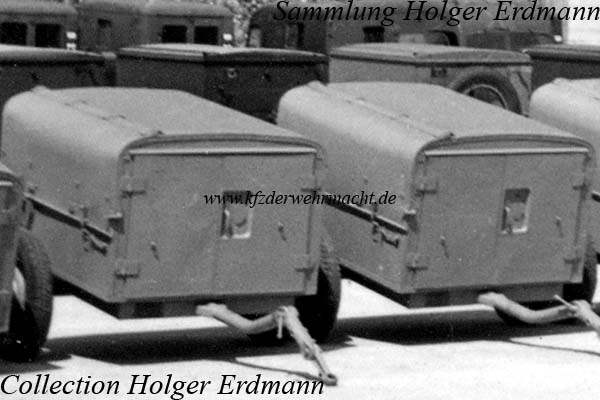 It was used for transportation of a small or large Beleuchtungssatz N - illumination set N. The power unit of the large Beleuchtungssatz N was a Maschinensatz F, too.